Francevillite: Mineral information, data and localities. Named in 1957 by G. Branche, M.E. Ropert, F. Chantret, B. Morignat, and R. Pouget for Franceville, the city nearest the type locality. 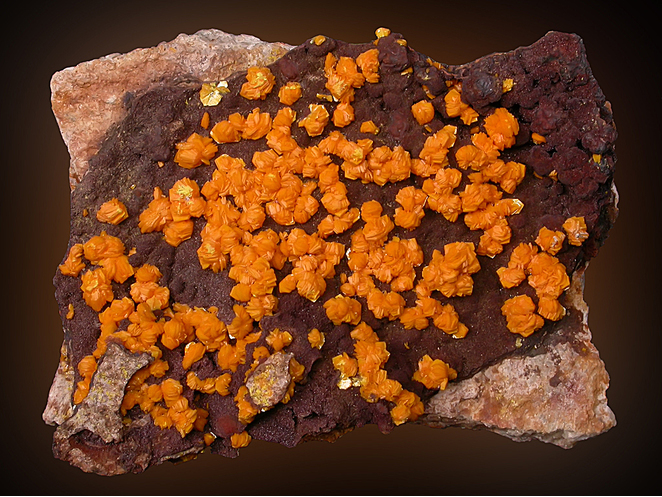 Compare also the Carnotite Group. Fritzscheite Mn(UO2)2(PO4,VO4)2 · 10H2O (?) Tet. 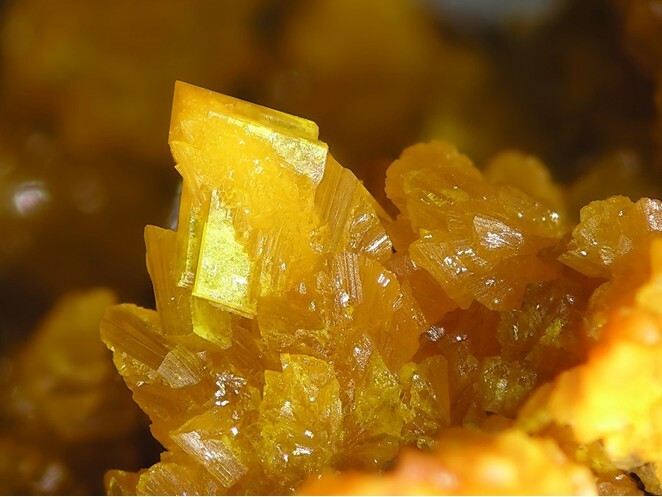 Carnotite Group A group of metal-uranyl vanadates. Curienite 41 photos of Francevillite associated with Curienite on mindat.org. Chervetite 30 photos of Francevillite associated with Chervetite on mindat.org. Mounanaite 16 photos of Francevillite associated with Mounanaite on mindat.org. Carnotite 3 photos of Francevillite associated with Carnotite on mindat.org. Autunite 2 photos of Francevillite associated with Autunite on mindat.org. Selenium 2 photos of Francevillite associated with Selenium on mindat.org. Straczekite 2 photos of Francevillite associated with Straczekite on mindat.org. Schubnelite 1 photo of Francevillite associated with Schubnelite on mindat.org. Bariopharmacosiderite 1 photo of Francevillite associated with Bariopharmacosiderite on mindat.org. Bariandite 1 photo of Francevillite associated with Bariandite on mindat.org. 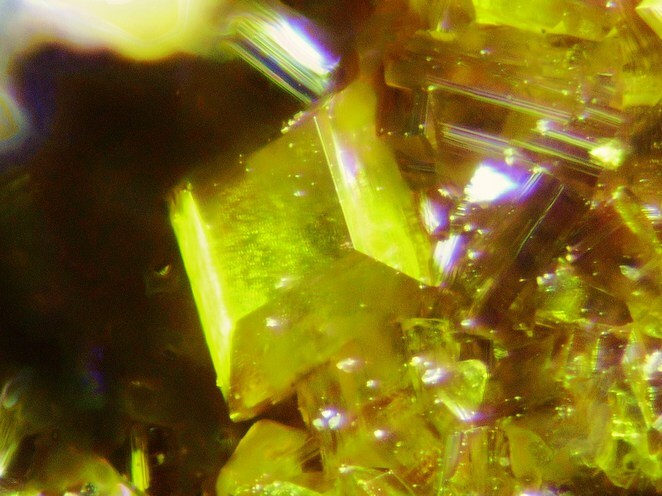 40.2a.27.2 Curienite Pb(UO2)2(VO4)2 · 5H2O Orth. Fleischer, M. (1958) New mineral names. American Mineralogist: 43: 180. Mereiter, K. (1986) Crystal structure refinements of two francevillites, (Ba,Pb)[(UO2)2V2O8]·5H2O. Neues Jahrbuch für Mineralogie, Monatshefte: 552-560.
ⓘ Radium Hill mine (Smith's Carnotite Mine; Radium Hill) ? ROSE, E.R. (1973) Geology of vanadium and vanadiferous occurrences. Geological Survey of Canada, Economic Geology Reports. 27, 130p. Pauliš, P., Moravec, B.: Francevillit z Litic n. Orlicí. Časopis pro mineralogii a geologii, 1990, roč. 35, č. 4, s. 425-427. Gallagher M. J. (1966): Francevillite from Rhodesia.- Bulletin of the Geological Survey of Great Britain, Vol. 25, (page 92).